The Joseph F. Cullman 3rd Library of Natural History’s 1602 edition of Ulisse Aldrovandi’s De animalibus insectis has always been a favorite of mine, and the rest of our special collections staff. Aside from being the first European work dedicated solely to the natural history of insects and featuring numerous incredible woodcut illustrations, it also retains its beautiful contemporary binding. 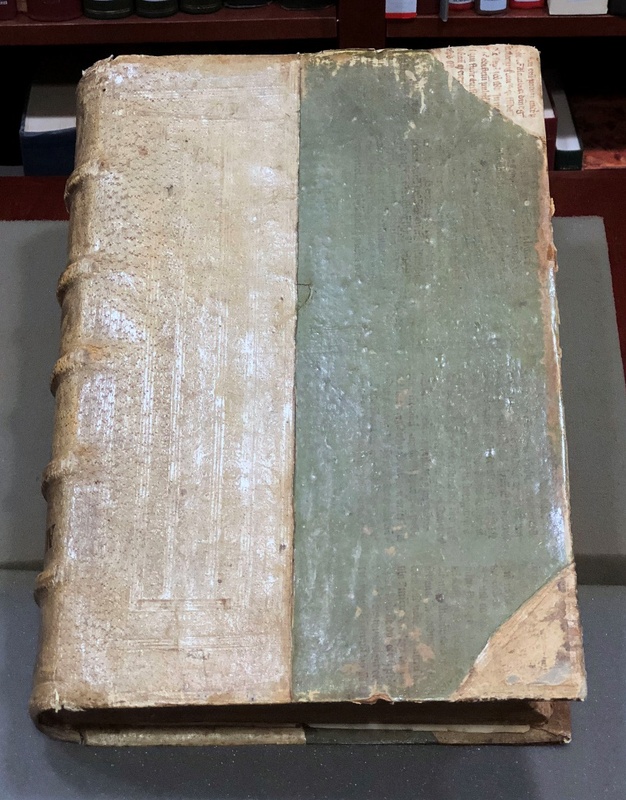 But this binding is just as dangerous as it is lovely: the green paint adorning the vellum of the front and back boards is laced with arsenic. Ulisse Aldrovandi’s De animalibus insectis (1602). Rather than being a bibliographic murder attempt or a deadly security system, the toxicity of the binding is actually an unintended consequence of an effort to keep this book affordable for 17th century buyers. The alum-tawed pigskin that covers the book’s spine and corners is durable and elastic, and would have been purchased as a whole skin by the bookbinder. But buying in new materials was expensive for bookbinders; it made more economic sense to use a mixture of new and old materials. In this case – as was common practice across Europe at the time – the binder recycled the strong vellum pages of a medieval manuscript to supplement the pigskin. In order to disguise this clever cost-cutting measure, the binder painted over the text of the reused manuscript with a coat of green paint. This style of budget binding was common in 16th– and 17th-century Germany. The strength of the vellum and pigskin covering, coupled with the wooden boards that make up the front and back covers, ensures that a number of examples of these bindings survive in libraries across the world. 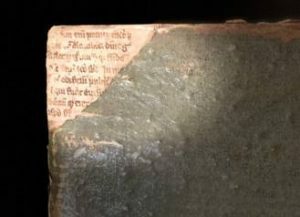 However, after over 400 years of use, many of these bindings are showing their age; one of the alum-tawed pigskin corners of the Cullman’s Aldrovandi has been lost, exposing an unpainted section of the recycled manuscript’s text. In addition, the green paint has been buffed to near-transparency in the areas where the binding has rubbed up against bookshelves or its shelfmates over the years, offering tantalizing glimpses of the text below. Spectrometer analyzing Ulisse Aldrovandi’s De animalibus insectis (1602). The rubbing away of the paint is a common issue among books bound this way; the library of the Royal College of Physicians, London, has a terrific example of more pronounced buffing. It is this exposure of the text hidden below the paint that inadvertently led to the discovery of the paint’s deadly properties. As a recent blog post describes, Jakob Povl Holck, Research Librarian at the University of Southern Denmark, took several books of this type to Kaare Lund Rasmussen, Associate Professor in Physics, Chemistry and Pharmacy, also at the University of Southern Denmark, in order to conduct X-ray fluorescence analyses (XRF) that would make the hidden text easier to read. Holck’s goal was to use the XRF to “filter through the layer of paint… and focus on the chemical elements of the ink below;” but in addition to discovering the expected iron and calcium used in medieval ink, the testing also revealed the high arsenic content of the paint. The images featured in Holck and Rasmussen’s blog post sent me scrambling into the Cullman’s vault to find my favorite Aldrovandi, which I immediately encased in bubble wrap and a plastic bag until we could test it to be sure of the composition of its green paint. 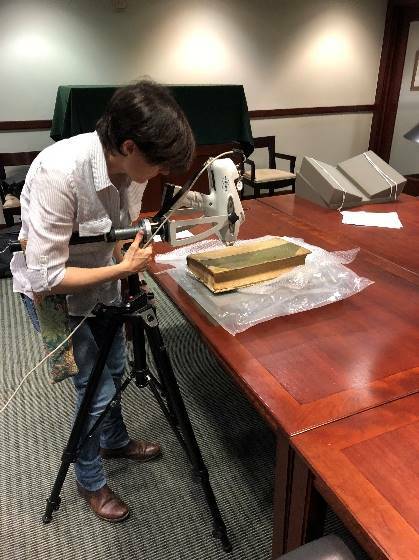 Thanks to the quick actions of Gwénaëlle Kavich from the Smithsonian Museum Conservation Institute (MCI), we were able to set up a time for her to bring XRF equipment into the Cullman to run some tests of our own. XRF is a non-destructive process that takes place at the atomic level, and involves knocking electrons out of place in order to cause the atom to fluoresce. As every element in the periodic table fluoresces in a characteristic way, this testing allows us to identify specific elements within inks and paints. Gwénaëlle Kavich analyzing Ulisse Aldrovandi’s De animalibus insectis (1602). The setup of the equipment was quick – a laptop, a tripod, and a hand-held spectrometer were all the tools that Kavich needed to perform her tests. Still, this setup took longer than the testing itself, which produced immediate and definitive results: the Cullman’s Aldrovandi was, indeed, covered in paint with a high arsenic content (see analysis below). Reading over the analysis, Kavich speculates that the arsenic comes from the use of orpiment (As2S3), an arsenic sulfide mineral that is bright yellow in color. This yellow would have been mixed with either Prussian blue (a possibility, given the iron that was also found in the analysis) or an organic pigment such as indigo (which cannot be detected using the XRF method). Analysis of Ulisse Aldrovandi’s De animalibus insectis (1602). The orpiment-indigo mixture yields a shade called vergaut, well known to medieval art historians as a commonly used green in paintings and manuscript illuminations; furthermore, The Grove Encyclopedia of Materials and Techniques in Art mentions that orpiment-based green mixtures were still being used in 17th-century Dutch paintings, which fits with the publication and roughly contemporary binding date of our Aldrovandi. Arsenic-based green paint experienced a resurgence of popularity in the 19th century with the invention of Paris green, which was inexpensive to manufacture and yielded a much more vibrant emerald shade. Holck and Rasmussen posit that it is this Paris green that adorns the covers of their books. However, bookbinding historians such as Nicholas Pickwoad maintain that the green was applied at the time of binding, a statement that is reinforced by the sheer number of books bound this way that exhibit similar or identical aesthetics. No matter when the paint was applied, it remains a danger to our researchers today. The arsenic in the paint has the potential to accidentally be inhaled or ingested by readers, as the paint crumbles and becomes airborne or sticks to fingers, and arsenic poisoning can cause dizziness, headaches, coma, and death. 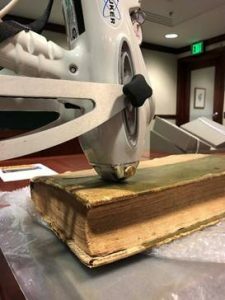 Vanessa Haight-Smith and Katie Wagner, Smithsonian Libraries’ rare book conservators, are coordinating with Holck and Rasmussen to develop the most effective way of making the book useable, but in the meantime they advise not handling the book at all. In the near future, Haight-Smith and Wagner will create Mylar sleeves to fit the book’s covers, which will be sealed at the edges. The book will also receive a made-to-measure box to keep it from contaminating its shelfmates. Until then, my favorite Aldrovandi will remain embalmed in bubble wrap and stored safely in the Cullman’s temperature and humidity controlled vault. 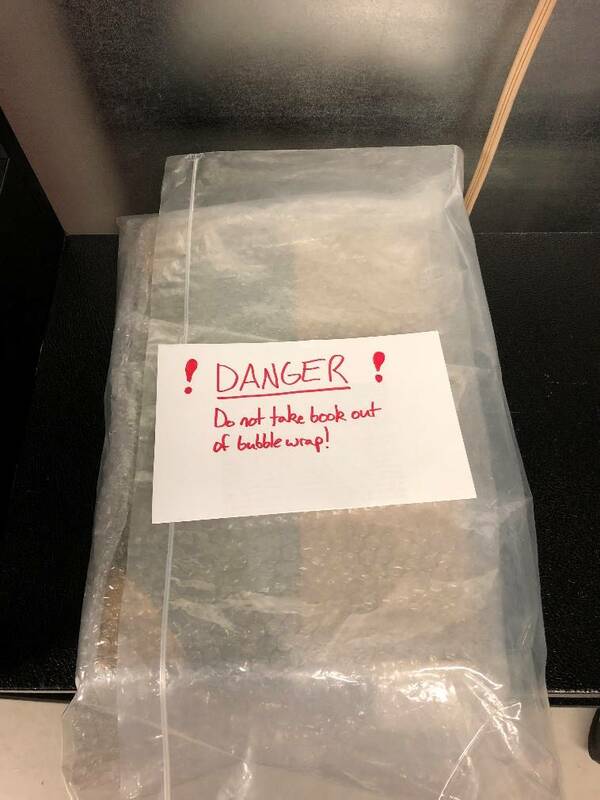 We are lucky here at the Smithsonian to have technology like XRF at our fingertips that can confirm our suspicions about potentially deadly items in our collections, but if you do come across a book like this, be sure to handle with care! When books can kill, you can never be too careful. Ulisse Aldrovandi’s De animalibus insectis (1602) in protective bubble wrap. Although our copy is under wraps for the foreseeable future, you can view a different (but still fascinating!) 1618 edition from Harvard University, Museum of Comparative Zoology, Ernst Mayr Library in the Biodiversity Heritage Library online. Nicholas Pickwoad, “European Bookbinding, 1450-1820” (course, London Rare Books School, London, UK, July 1, 2016). Kavich, G., 2018. Smithsonian Museum Conservation Institute XRF Analysis Report: Binding of Ulisse Aldrovandi’s De animalibus insectis Libri septem (MCI#6851). Smithsonian Museum Conservation Institute, Suitland, MD. Gerald Ward, ed., The Grove Encyclopedia of Materials and Techniques in Art, Oxford: Oxford University Press, 2008. P. 512. Allie, I just saw this mentioned in the American Libraries Direct, picked up from your blog post! I had no idea about this book. Thanks so much for the write-up! Fascinating. Thanks for sharing this in your blog! Extremely fascinating. Would like to use this as a manner of death for a murder mystery I’m writing.